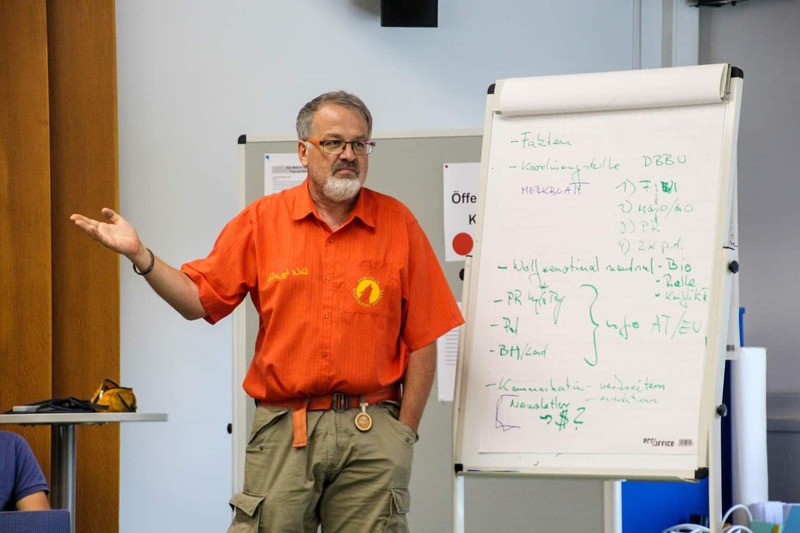 While there is a loud and often controversial discussion being held in Austrians media concerning the return of the wolf to Austria, the Naturschutzbund Austria supported by the Austrian Government held a wolf dialogue workshop in Linz in the chamber of agriculture. The official senior representatives of several Austrian Hunting associations, the sheep herding association, different provincial chambers of agricultural, ministry of defence (the military area Allentsteig is home to Austria´s first wolf pack), scientists, nature conservation organizations, government authorities and a representative from the Austrian Ministry of Environment, developed a list of concerns and matching opportunities as well as several demands. The Sheepherders for example demanded a clear commitment of the Austrian Government to a peaceful coexistence of wolf and livestock holders as well as a more unified financial compensation system for incurred costs and damages by the wolf especially from the EU. The hunting associations identified their concerns but also likewise presented several positive opportunities. They also called for a compensation system to offset possible devaluation of hunting properties due to the impact of the wolf. Communication experts from different organisations identified the need of a more fact based communication strategy to reduce the emotional overtones and hype often associated with reports about the return of the wolf. The researchers and scientists identified the need for a more unified and standard based monitoring of wolves in Austria and neighbouring countries. All of the participants expressed their concerns and their frustration that currently the Austrians politicians are shying away from a clear and unequivocal commitment to the coexistence of wolf and humans and are lagging behind in providing the necessary resources to a country wide action plan concerning the wolf. Also all participants called for a central wolf centre coordinating the communication, the monitoring, the herd protection measures and the financial compensation similar to Switzerland. All participants were positively surprised about the high degree of respect for each others concerns and the excellent interdisciplinary and cross-roganisational cooperation.